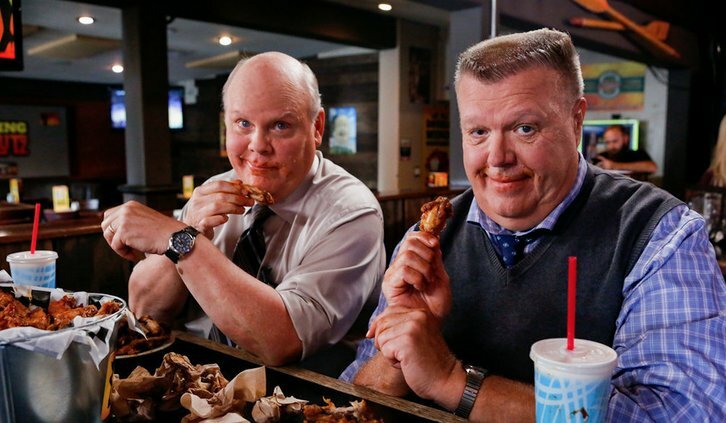 We have been waiting so long to find out what happened to Hitchcock and Scully and in this character centred episode we finally go our answer: Chicken Wings. The episode begins with a young Hitchcock and Scully in 1986 about to bust a drug dealer called Gio Costa in an old school cop show style. Young Hitchcock and Scully are badass, and I couldn’t help wondering what happened to them. As the episode continues, we find out that Hitchcock and Scully are under investigation for that exact case so Holt put Jake and Charles on the case to find out what really happened. For majority of the episode it seemed as though Hitchcock and Scully were guilty of stealing money and it did not look good for them, especially when they trapped Jake and Charles in the Beaver Trap van. At one point I really began to think that they were guilty of stealing the money for themselves and I was very shocked. However, of course Hitchcock and Scully would never do such a thing. Yes, they took the money however they gave it to Marissa who was their informant and Gio Costa’s wife, in order to protect her from the busted Costa because she wasn’t given witness protection. By the end of the episode I couldn’t believe that I ever thought Hitchcock and Scully would do something bad. In the end Holt and Amy came to the recuse to save Jake, Charles, Hitchcock, Scully and Marissa from Costa. But whilst Costa is being apprehended, he manages to take two shots at his ex-wife, however, heroically Hitchcock and Scully jump in front of her and take the bullets. The famous Wing Slutz sauce saves them both. 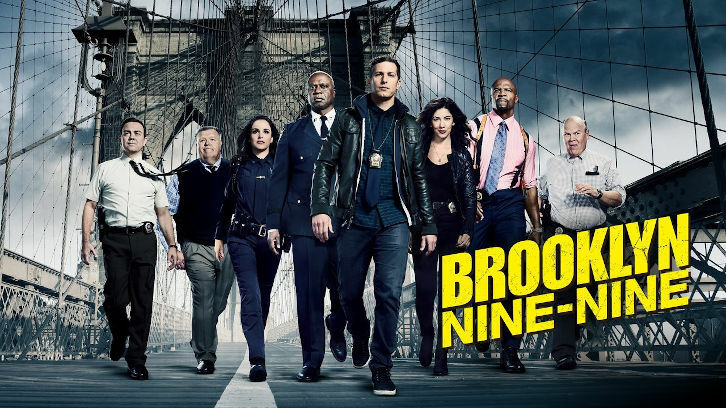 Meanwhile Jake and Charles were investigating Hitchcock and Scully, the precinct was in chaos. People are climbing over desk, there are fish exploding in the microwave and Gina is preparing Holt for a TV interview. It’s the Upstairs People Vs. the Downstairs people or Amy’s Squad Vs. Terry’s Squad. Watching them fight was very funny and I loved Amy saying “Oh I’m sorry for the untidiness my Lord” in a posh English accent in front of Holt. 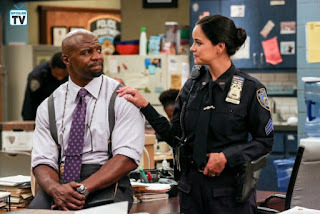 Watching Gina do the interview instead of Holt and finding out that the network had never gotten so many viewer complaints was great. -Can we talk about the casting? The two actors casted to play young Hitchcock and Scully were such a fantastic choice. Overall, I loved the episode it was funny, and we finally got to find out what happened to Hitchcock and Scully. Let me know what you thought of the episode in the comments below!